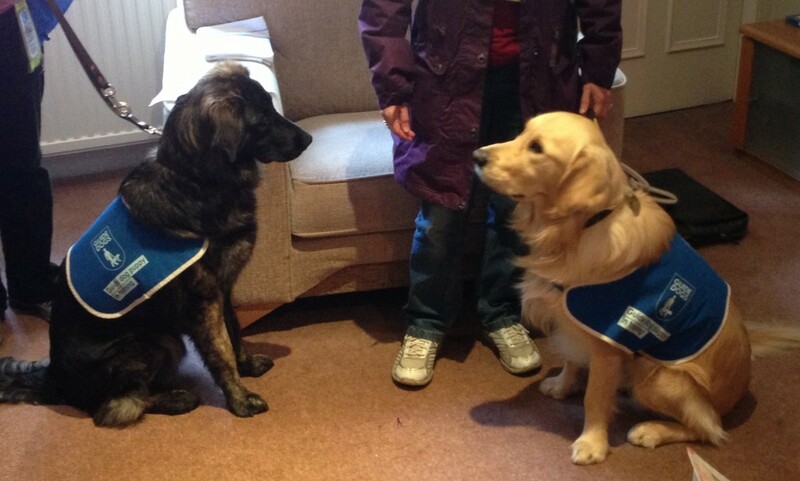 Despite my best efforts to make monthly training interesting, I was easily trumped this month by Reese and Sandy from Guide Dogs. They kindly brought along Pamela Munro, the community engagement officer for Edinburgh, who gave us a fascinating insight into the work of the Guide Dogs charity. The session included simulation of common eye conditions, and a discussion on the best way to guide visually impaired people. We all realised the common pitfalls that we can fall into when we guide people, even in the practice. You can download the Guiding leaflet here to learn how to do it properly. And for you visual learners, here’s a useful video. We were all interested to find out about who is suitable for a guide dog. Learning that a person doesn’t have to be registered as blind, there are no age restrictions, and they don’t need to be referred from a GP or optometrist. Many Thanks to Pamela and her team for their time and effort. We look forward to seeing them back in the practice for a practical guiding session soon!